POLAR BEAR TAKES AN ARM AT THE MANITO ZOO! This is one of the first of the articles we will release on the history and building of Manito Park. Please tune in each week for the next chapter. 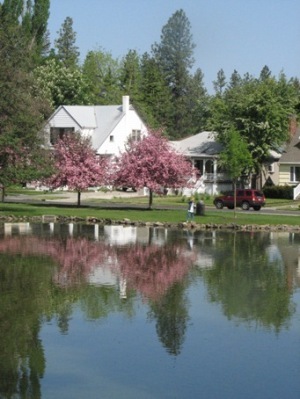 Next week we'll hear about the man who actually founded the park and his beginnings in Spokane. On July 11, 1923, 9 year old Elizabeth Harris was visiting the Manito Zoo with her Nanny. She put her hand, full of bread, into the Polar Bear enclosure and one of the bears pulled her arm into the enclosure while the other, smelling blood, attacked it. Attendants immediately came running at the little girl’s screams, but as they pulled her away from the cage, her arm remained inside. Little Elizabeth so loved all the Manito Zoo animals that she insisted no harm come to the bears over this. Although her father was a prominent Spokane attorney, no lawsuits were ever filed. Shortly after the accident, the family moved to Seattle where Elizabeth grew up, graduated from the University of Washington and later married George Spence, also a graduate of U of W. They had one son, Richard Spence who is still living in Bellevue, Washington. According to Richard, his mother’s life was full and rewarding and filled with acts of charity and kindness toward others. She knew of no handicaps in spite of her accident many years earlier. Elizabeth passed away in 1981 and was buried next to her husband in Arlington National Cemetery. Tune in next week for the next chapter.